At one time the military actually tried to develop inflatable planes that were strong enough to fly, but easy to transport. Those never materialized, but the technology involved—a drop-stitch fabric that can be inflated to very high pressures—has enabled Volvo to create an inflatable child car seat that's just as safe as everything already on the market. Using a built-in silent pump, the can be fully inflated in less than 40 seconds at the push of a button. 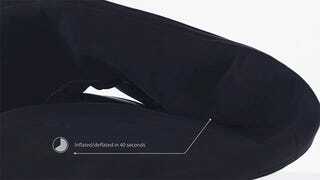 It can be deflated the same way, and when folded down can easily squeeze into a backpack. Ask any parent who's had to lug a child's car seat when flying, and they'll tell you that's a brilliant innovation. At just over eleven pounds the inflatable seat is a lot lighter as well. And the electronics that control the air pump are Bluetooth-enabled, which means that you could, at least in theory, inflate and deflate it from a smartphone app.